Why should walking to the office be dull? Our commercial landscape maintenance services will ensure that the lawn/landscape around your office building are neat, clean, interesting and eye-pleasing. As a business person, you know an attractive outdoor environment adds value to the building and is more likely to attract customers or partners. Our services are not limited only to lawn care and maintenance. Because we want to do our best to make your dream come true, our landscape artists will go the extra mile to give the building’s surrounding that special extra something. Do you want to build your own haven around your office building? Our more-than-capable team is there for you. With a few twists of our magic want (namely landscape architects using computer simulations and contemporary design trend research), we will give your landscape a complete makeover, transforming it into an aesthetically pleasing environment – a sure way to impress partners and beneficiaries, as well as your employees. Our top-quality products and services, as well as our passion for the things we do, cannot be matched by any of our competitors. For us, there are no compromises and no middle ground – we want perfection, clarity, client satisfaction or nothing. We have an iron-clad policy when it comes to client satisfaction. If you’re not satisfied with our work, you can ask us to do it again, free of charge. In the event that our renewed efforts are below your expectations, we will give you your money back and ask one of our competitors to the job for you. 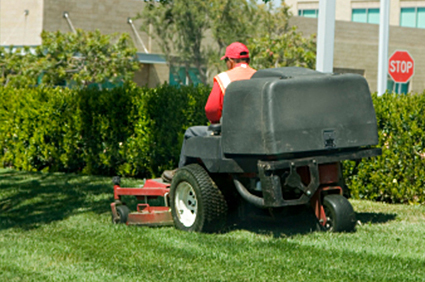 Holmes Property Maintenance offers a wide variety of commercial landscape maintenance services. Lawn aeration is the first step you should take towards growing a healthy and green lawn, especially after construction works, when the ground has been compacted. Aeration has many benefits – prevents the formation of puddles, increases oxygen change, increases water absorption rate, and strengthens the turf roots. Lawn fertilization and weed control services will be carried out throughout the year. They ensure that the lawn stays clean, fresh, and green until the cold months of winter. Our yard clean-up crews stand at the ready to free your yard from vegetal debris and clutter during the first weeks of springs, and in the fall, when leaves begin to fall from your trees. Our company will also take care of the property for the duration of our services and has its own garbage disposal unit. Our emergency response units will repair those defective sprinklers in a jiffy. You can also call us during spring to make sure that the sprinklers are properly activated, and we will also help protect your irrigation systems during the winter. Our team will mow the lawn for you at a moment’s notice, leaving behind a smooth, clean, and evenly-shaped surface. To mow the lawn in spaces otherwise inaccessible by our lawn mowers, we use edgers and trimmers. Because flowers are meant to please the eye and ensnare the sense, we offer to weed all your flowerbeds as well on a regular basis. To benefit from all these services and then some, all you have to do is ask us for a free estimate and a long-term strategic plan. You will surely enjoy our customized pricing lists, our 100% satisfaction guarantee policy, insurance coverage and professional approach to each of these tasks!